Steam Tug Brent01621 855058work SailingBrent is one of the very last of a long line of steam powered tug boats which trace their origins back to the first use of steam power in the 1840’s. Built as part of the War effort in 1945 for the Admiralty, she didn’t see war service, but was sold to the Port of London Authority, who used her to help maintain the Thames as a navigable waterway and later to tow lighters and barges in the Royal Docks. She is a precious and unique historic relic of London’s maritime history, which deserves to be restored and made working once again. Brent survived because, as the last PLA tug to be sent for scrap in 1970, she was bought from the Shipbreaker’s yard in 1971 and kept for pioneering preservation and private use in Maldon for the next 40 years. She has become a much loved local landmark and features in numerous paintings and photographs, books and magazines. She features on the Maldon Embroidery at the Maeldune Heritage Centre. 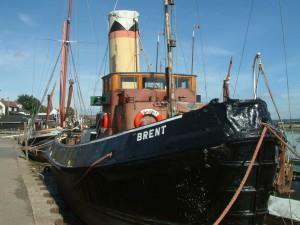 The Steam Tug Brent Trust took over the ownership of the vessel in 2011. Largely unchanged in appearance from her working days, the Trust wants to restore her back to operating condition as she was, complete with working steam engine and boiler. Brent is one of the very last of a long line of steam powered tug boats which trace their origins back to the first use of steam power in the 1840’s. In a prominent position by the footpath, Brent is viewed by the thousands of passer’s by who visit the Prom. On our open days the public are able to come aboard, walk round the deck, go into the wheelhouse, and down into the accommodation and engine room. Static museum vessel. Spaces and access not suitable for the disabled or push chairs. Admission is free. Open on Bank Holidays and other weekends in conjunction with other events in the area, usually from 11.00 – 5.00 p.m. Closed November to April. Group visits, guided tours and talks by arrangement.